Experienced party help...so you can spend more time with your guests! I have been trained by, and I have worked with, Paula LeDuc of Emeryville; Blue Heron Catering of Oakland; Now We're Cooking of San Francisco; & Grace Street Catering of Alameda. Through various staffing agencies, I've served at a wide variety of private and corporate events. I helped start a San Francisco caterring company as their Event Manager. 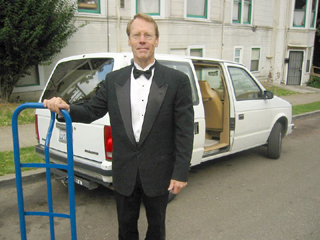 I worked for two years as Event Coordinator for an Oakland party rental company. My services include up to one hour of free pre-party telephone consultation to go over the details with you: what you may need to rent, the appropriate quantity of food and beverages, etc. 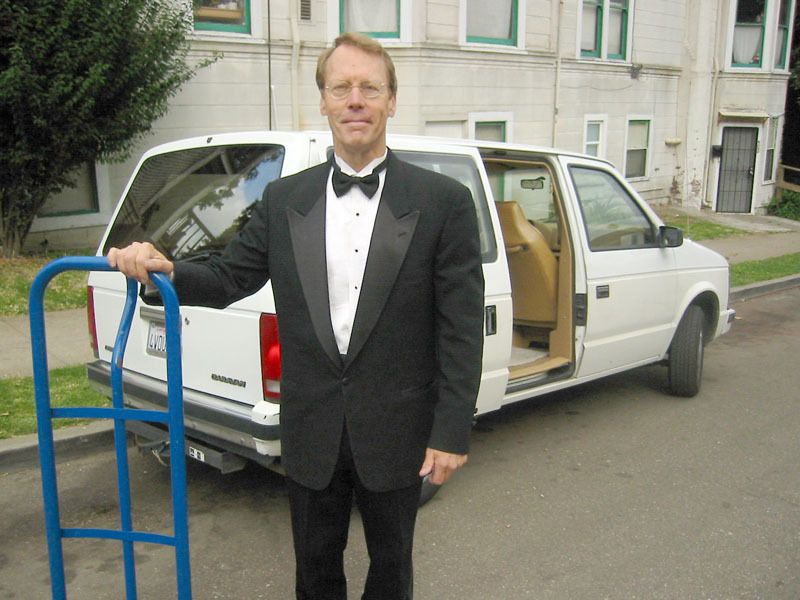 I can get you a discount on rentals & delivery, and I'll pick up ice for you on the way to your party. All for no extra charge. My rates are $30.00 an hour, with a five-hour minimum. Please call me or email the anon address above. I look forward to helping make your event a success! And if you need a larger staff than just one person, I can put together and manage a crew of excellent servers—people with whom I have worked many times. I will consult with you to determine the appropriate number of servers for your event. KEEP YOU FROM HAVING A GREAT PARTY! In challenging economic times like these, it is clearly a good idea to be frugal and to cut back on unnecessary spending. But it's precisely when things seem difficult and uncertain that it's most important to gather together with friends and family...to have some good conversations and maybe even a few laughs...to share food and drink...and just to have a good time with one another! Likewise, it makes sense to continue to network with business and professional associates, and with clients and customers, in a relaxed and informal setting, to nourish those valuable relationships. And we wouldn't want to let a wedding, a birthday, an anniversary, a graduation, a death, or a birth go by without some special event commemorating that once-in-a-lifetime passage. So, how do you create a party without spending a bundle, and without driving yourself crazy managing the details? The "Venue": There are a few not-too-expensive places available, and I can advise you about those. But you might also consider having the party at your home, or a friend's home, or even (while the weather is nice) at a local park. Staffing: This is my specialty, of course. If we need to hire more servers, I can help you keep that number to a minimum by hiring smart, experienced, hard-working individuals. Rentals: I can negotiate good prices on rentals for you. I know, for example, where to get table linens for $4.50 instead of $13.00...You might also decide to use disposable (recyclable) plates, beverage cups, etc. Many of my clients get their menu items from local restaurants or delis, or prepare it themselves, or have a "pot luck" contributed by family and friends. I'm not a chef, but I can work with you to put together a great tomato sauce with meatballs; boil some pasta; roast a turkey and/or poach a salmon; bake some garlic bread; and throw together a tasty Caesar salad. Hors d'oeuvres? Trader Joe's has all the ingredients for a gourmet cheese platter, and their frozen appetizers are pretty tasty when they're hot from the oven. Cut up some fresh organic fruit and vegetables and put out a couple of dipping sauces. For the bar, pick up a few bottles of Charles Shaw wine ("2-buck Chuck"), a case of your favorite beer, a few cans of soda...and we've got a party! If it happens that I'm already booked for the particular date you want, I can definitely help you find some top-quality professionals who are good with food prep, bar setup, and service. And they're fun to work with, too!